Remember how I was telling you just a couple of days ago that I really like making chilled desserts when it’s hot? I think I may have a real problem. Right after that, I was desperately trying to make room in my refrigerator for something or other when I realized that the lack of room was due to the three icebox pies in there. 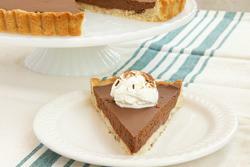 I have since given away two of them, but I haven’t been able to part with this Chocolate Mascarpone Tart. 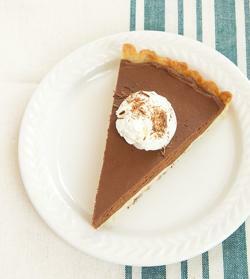 When I made that Nutella Pie a while back, I was reminded of how much I love mascarpone. Of course, what’s not to love about a delicious ingredient that’s essentially just cream? I opted to add a splash of hazelnut liqueur to the filling. Coffee liqueur, bourbon, or a whole slew of others would be equally as delicious. Let’s backtrack to the crust for a minute. 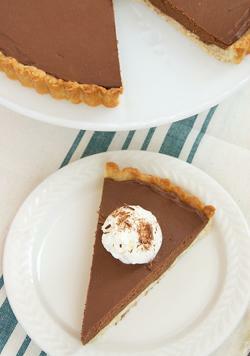 It’s essentially the same crust that I used for Lemon Cream Tarts. I just used brown sugar for a little different flavor. You can, of course, use either granulated or brown sugar, but I really like the brown sugar-chocolate combo. This is a simply lovely dessert. It’s so smooth and creamy. And, it has a wonderfully subtle sweetness. It’s low on the effort meter with a high deliciousness payoff. Those are my favorite kinds of desserts!